This hanukkia wishes you a peaceful Hanukkah holiday with its twin wings of olive branches that have been etched into this crystal menorah. Your Jewish holiday of Hanukkah will be blessed with peace with this crystal Menorah for sale that incorporates an olive branch motif with geometric details. 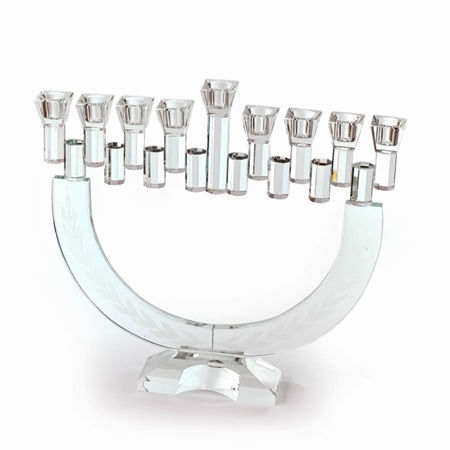 Made in Israel of solid, polished crystal, the candle holders are fashioned as squares and placed atop nine cylinders that are beveled into octagons, with the middle one being taller for the shamash. These are connected across the top by another eight beveled cylinders placed half way down from the candle holder cylinders. The two outer, lower cylinders are attached to a U shaped piece of polished crystal, onto which has been etched a sweeping olive branch which is frosted and is the highlight of the piece, both symbolically and artistically. All this stands on a crystal foot which is fashioned into a pyramid shape with two curved indentations at the front and back, which mirror the U shaped body. This unique piece of Judaica is stylish and elegant and stands a majestic 34.5cm high and 37cm wide. This will clearly be a showpiece for your Hanukkah holiday and a welcome addition to any Jewish home, as well as make a treasured gift for a Bat or Bar Mitzvah or anyone who loves the Jewish holiday of Hanukkah, and can appreciate the symbolism.